Gregory W. Yasinitsky, Regents Professor of Music, earned degrees at the Eastman School of Music (DMA, San Francisco State University (MA, BM) and the College of San Mateo (AA). Yasinitsky is a member of the Washington Music Educators Hall of Fame and recipient of the Washington State University Eminent Faculty Award—the top honor available to WSU faculty. He also received the Marian E. Smith Faculty Achievement Award and was selected to present the 2008 WSU Distinguished Faculty Address. Additionally, Yasinitsky received the College of Liberal Arts Distinguished Achievement Award and the 2005-2008 Edward R. Meyer Distinguished Professorship Award. He is also the recipient of the William F. Mullen Award for Excellence in Teaching from the WSU College of Liberal Arts. Yasinitsky served as Director of the School of Music from 2011 to 2018. During his tenure as Director, the School enjoyed greater visibility and recognition, increases in the number of faculty and graduate teaching assistants, the purchase of new instruments and equipment, and the creation of WSU Recordings, a peer-reviewed, academic recording label. From 1982, to 2011, Yasinitsky served as Coordinator of Jazz Studies. Under his leadership, the Jazz Studies Program received widespread recognition including awards from Down Beat magazine, invitations to perform at prestigious conferences—including Jazz Education Network (JEN) and International Association for Jazz Education (IAJE) Conferences—and top awards at major festivals. Yasinitsky has an international reputation as a composer, arranger, and saxophonist. He is the recipient of the 2018 American Prize in Orchestral Composition. His teachers in composition include Joseph Schwantner, Wayne Peterson, Lou Harrison, Samuel Adler, and Robert Morris. Yasinitsky has written music especially for Clark Terry, David Liebman, David Sanborn, and the USAF “Airmen of Note” big band. Yasinitsky’s music has been performed in more than 40 countries and he has received grants, fellowships, and awards from the National Endowment for the Arts, The Commission Project of New York, Meet the Composer West, ASCAP, Artist Trust, Washington State Music Teachers Association (WSMTA), and the Washington Music Educators Association (WMEA). Over 200 compositions and arrangements have been published by Kendor Music, Warner Brothers, Hal Leonard, Advance Music (Germany), Walrus Music, University of Northern Colorado Jazz Press, Falls House Press, Dorn Music, Daniel Barry Music, and Hoyt Editions. Yasinitsky has also accepted numerous commissions for jazz, orchestral pieces, solo works, and chamber music. Selected orchestral and chamber works can be heard on compact discs released by Vienna Modern Masters, Arizona University Recordings, and Open Loop Records. Yasinitsky’s principal saxophone studies were with Ramon Ricker, Joe Henderson, Donald Caroll, James Matheson, and Jerry Vejmola. As a saxophonist, Yasinitsky has appeared with numerous distinguished artists including Lou Rawls, Sarah Vaughan, Ella Fitzgerald, Ray Charles, Louie Bellson, Stan Getz, Lionel Hampton, Manhattan Transfer, Mel Torme, and Clark Terry. 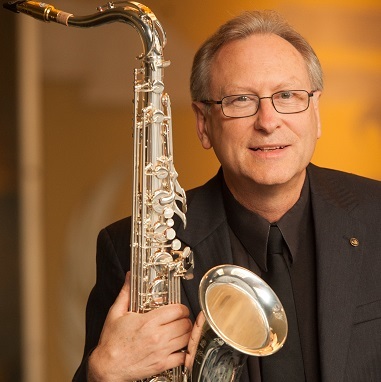 Additionally, Yasinitsky is principal saxophonist with the Spokane Symphony and has performed as a member of the San Francisco Symphony, San Francisco Opera Orchestra, and Oakland Symphony. Yasinitsky can be heard with Tom Harrell, Art Lande, and others on recordings released by the Musical Heritage Society, Soul Note, Palo Alto, and Revelation Records. His playing and compositions can also be heard on compact discs released by his own label, YAZZ Recordings. Yasinitsky is also in demand as a conductor and clinician, and has presented concerts and workshops throughout the United States, Canada, Europe, and Japan. Additionally, Yasinitsky has been the subject of articles and reviews in Jazz Player, Saxophone Journal, The Instrumentalist, Jazz Educators Journal, and Yamaha’s New Ways magazines, and he has contributed articles to numerous scholarly journals. Yasinitsky is a Yamaha performing artist and clinician and a JodyJazz Artist.